These images are an example of a Tillaux-Chaput injury clinically depicted (below left) and in a CAT scan (below right). This injury is a result of a pull of the anterior tibiofibular ligament pulling off the fragment of bone in which it is attached on the distal lateral tibia which is shown anatomically (above center). This fracture is a fracture of the lateral aspect of the distal tibia. It is a Salter Harris III fracture. The mechanism of injury is lateral translation. 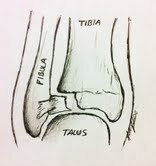 The anterolateral aspect of the tibial growth plate is open when the remaining plate is closed. The anterior tibiofibular ligament avulses the anterolateral epiphysis through the growth plate. The fracture line extends into the ankle joint. Although readily visible on x-ray, CT scan may be indicated to appreciate the extent of the injury. Growth arrest is not a concern because of the more mature nature of the growth plate. Closed reduction may be attempted to reduce a gap of 2 mm or less and to align the joint surface. Cast immobilization is then applied. If adequate reduction is not achieved, open reduction and internal fixation is performed.